We had eight Swift youth go shopping on the morning of Saturday, Sept. 22, for the Swift Church food pantry. They went to Walmart and played a fun shopping game, which included not only finding the items we needed to complete the shopping list, but also some tasks to complete — like taking a selfie with a Walmart employee (with their permission, of course). I think everyone had fun — they were all smiling in the pictures. Thank you to Tara Morrow and Lynn Barnwell for helping out with the transportation. And thank you to Tara for keeping us organized, sending texts, putting the food away in the pantry, and so much more. ►Nine youth complete months of study and become confirmed as church members. ■ SWAG (formerly Kids’ Club) is for children in grades K–4. ■ GΦG is our youth group for ages fifth grade through high school. We meet at the church and have a lesson, games and a small meal. ■ Refuel, our Wednesday night youth group meeting, is from 6 to 8 p.m. You are encouraged to invite your school friends, neighbors, etc. On March 6, Ash Wednesday, we will attend service together and then have dinner in the youth room. ■ If anyone would like to prepare a meal, please let Teresa Thomas or Tara Morrow know. March 17 — 4 to 6 p.m.
■ Our youth participated in a bake sale held in February with the youth at Orange Beach Presbyterian Church. The sale raised $760, which will go toward costs for the Montreat Youth Conference in June. You can hover over an image to pause, or you can click on a photo to enlarge it and move through larger images. 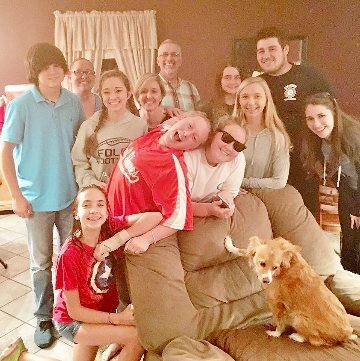 The October Refuel gathering took place at the home of Phil and Jody Beth Melton. Are you willing to provide a meal for a youth event? Please consider providing a meal for a youth event (grades 6–12). To find out more, contact Kathy Menk by calling her at home (971-6509) or by sending an email to mkmenk9010@gmail.com. The youth of the church have Swift youth T-shirts available for sale. They are $10, and you can choose between blue and gray and sizes small, medium and large. Contact Ginny Kleinschmidt or a member of the youth group for more information. There was swimming, food and fun on the afternoon of Aug. 21 at Pastor Keith and Lisa Cardwell’s home. The event was for sixth-through-12th-graders and their parents. Photos from the youth ministry kickoff pool party for youth and parents are the latest addition to the gallery. You can hover over an image to pause, or you can click on a photo to enlarge it and move through larger images. 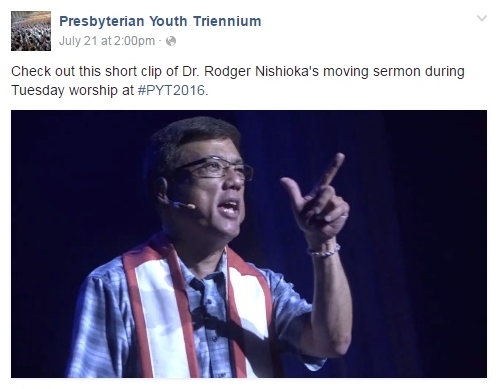 ►Here’s a report on the Presbyterian Youth Triennium. Sunday school for children and youth is in the annex. Classes start at 9 a.m. The youth meet (grades 6–12) in the youth room, and those in grades K-5 meet in the children’s ministry room.